A Brooklyn family is mourning the death of an 11-year-old boy who may have died of an allergic reaction just to the smell of fish. Jummy Olabanji reports. 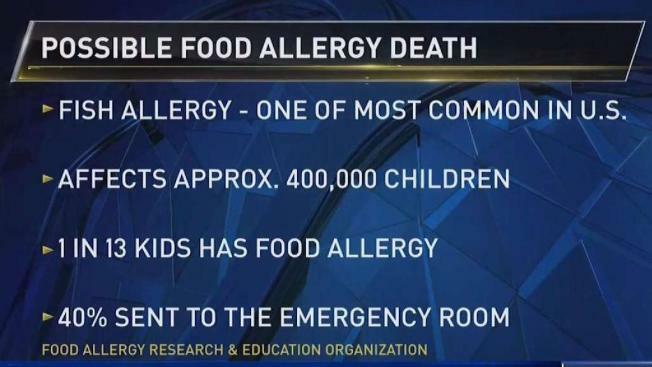 Authorities are investigating the apparent sudden food allergy-related death of an 11-year-old boy in Brooklyn, and law enforcement sources confirmed to News 4 that detectives are looking into whether the smell of cooking fish could have triggered a reaction. Cops were called to the 82nd Street home of Camron Jean-Pierre around dinner time on New Year's Day. They found the boy unconscious. He was taken to a hospital, where he was found dead. The medical examiner's office will conduct an autopsy to determine how he died, but police say it appears to be the result of some sort of food allergy and they suspect no criminality. Sources confirmed to News 4 that authorities were looking into whether the reaction was triggered by the smell of cooking fish. That detail was first reported by the Daily News. The investigation is ongoing. A single purple latex glove lay on the pavement outside the family's home in Canarsie Wednesday morning. Nearby, a scooter sat against a brick wall near what appeared to be a child's sports trophy. Fish is one of eight major food allergies responsible for most of the serious allergy reactions in the U.S. and can produce life-threatening reactions in rare cases, according to Food Allergy Research & Education. It affects approximately 400,000 children in the U.S.
An urgent care doctor told News 4 she couldn't speak to the specifics of the boy's case without knowing all the facts. But generally speaking, she said inhaling certain fumes can trigger deadly reactions for some children with severe allergies. "After using Epi, it's always a good idea to keep some Benadryl on standby," said Dr. Janette Nesheiwat. "If you are a patient who has severe allergies, sometimes your doctor can give you steroids to have on hand until you can call 911."